Hi Paul, You still have not sent me an invoice for the parts you sent last week. But was not without drama: First the spoke fiasco: I took the measurement for the new spoke from the broken spoke which was 238 but when I removed the tyre and tried to fit it I needed 243mm. I actually had two 244 but had demised these as too long so all your effort and my panicking was my stupid assumption.... never assume. Do you sell 242, 243 or 244 spokes? Then the sprocket drama On Thursday I could NOT remove the sprocket and went to a friends house and judiciously heated it with the oxy and tried some more but to no avail. We tried riding on Friday evening hoping all might be okay with the old unreversed sprocket but couldn't even get out the drive without it slipping. I was pretty sure we would not be riding our tandem on Sunday. On Saturday with a large Stillsons pipe wrench and fully expecting to destroy the sprocket we managed to get it removed and reversed. On Sunday when very dirty on two steep climbs we had to walk (which was a welcome break) due to some jumping but other than that it made it "just". So a new sprocket has been ordered. I am hoping you can help here! Any suggestions to make shifting easier please. 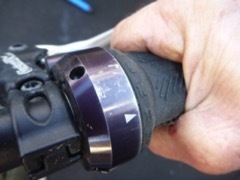 This is quite stiff and most of this is not the resistance in the cable but the torque required to turn the nut at the end of the cables on the hub. With wet gloves in 3 1/2 hours this had become blister and it was very difficult to turn the shifters. This has been an ongoing problem in 100km races where by the second half changing gears smoothly was VERY difficult. note the blister on the base of my thumb, photo taken Monday. Finally about the chain guides: We lost the drive chain once outboard onto the stockers pedals during the race so I have done quite a bit of research on chain guides and the E13 and in fact almost all chain guides will not extend to the 54 mm chain line that Rohloff requires so it has to be the Rohloff version. Even then I am a little concerned as the seat tube is 35.4mm diameter while the Rohloff only goes to 34mm so I am hoping it will fit. Thanks for your help in this regard. I am still considering the Widgit for the timing chain but one step at a time.